With crucial help from our partners at the ASPCA, Maddie’s® Shelter Medicine Program can provide talented students and professionals the opportunity to advance their skills in shelter medicine and make a difference in the lives of homeless animals. 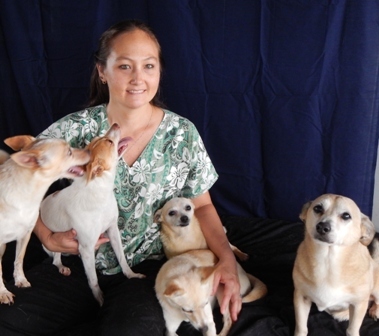 We are proud to announce the recipient of this semester’s ASPCA scholarship for the Maddie’s® Online Graduate Certificate in Shelter Medicine, Dr. Kristina Kanani Henricks of the Hawaii Island Humane Society. Dr. Henricks is currently enrolled in Shelter Animal Physical Health, our fall online shelter medicine course. Thanks to generous support from the ASPCA, veterinary students and professional veterinarians alike are able to expand their knowledge and learn lifesaving techniques that they can use to improve the welfare of homeless cats and dogs across the United States and around the world. Congratulations to Dr. Henricks, and please join us in saying ‘thank you’ to the ASPCA for supporting shelter medicine education! “I was born and raised on the East side of the Big Island of Hawaii (Hilo) and after attending 15 years of college on the mainland, have now found my home on the West side (Kailua-Kona). After completing a PhD in Psychology in New York, I earned a DVM from Purdue University, College of Veterinary Medicine in 2004. I was in private practice for over 3 years in Kona before my boss sold his practice. I was approached to work for the Hawaii Island Humane Society and at first was not interested because I had already began formulating plans for a mainly mobile practice and it seemed distasteful to work for an organization which euthanizes. It took the Executive Director and a prominent Board Member (a top local Vet) one cup of coffee to convince me to take the job and spay and neuter feverishly to help reduce the numbers of pets being euthanized every year. Supported by a grant from Maddie’s Fund®, our on-campus shelter medicine certificate program is now available online as the Maddie’s® Online Graduate Certificate in Shelter Medicine. The graduate certificate program includes three comprehensive online courses: Integrating Veterinary Medicine with Shelter Systems, Shelter Animal Physical Health, and Shelter Animal Behavior and Welfare. They feature in-depth instruction from leading shelter medicine experts combined with the convenience of online education. Understand the critical role played by veterinarians in protecting the health and welfare of sheltered dogs and cats. Recognize and respond to compromised physical health of sheltered animals. Recognize and respond to compromised behavioral health of sheltered animals. Please contact us for more information about the Online Graduate Certificate or any of our educational opportunities. Taught entirely online, this course focuses on evaluating shelter protocols and learning to recognize and respond to common threats to the physical health of shelter animals. Learn more on the Shelter Animal Physical Health course page. This semester’s class includes students and instructors from 26 different US states and countries! Read more about how shelter medicine is going global.